I can't believe that it's Christmas in the morning! It feels like this year has just evaporated and Christmas is all of a sudden upon us. Presents wrapped, pamper complete and new jim jams on, I'm now thinking what I'm going to wear tomorrow, and most importantly what makeup. I'm not a makeup snob by any means and do buy a lot of things from the high street, but I am drawn to the more expensive side if I'm honest. There's something so appealing about beautifully packaged, perfectly formed luxury makeup that I just can't get enough of. I'm trying to decide which of these little beauts will grace my eyes for tomorrow's festivities, and its a tough call. The most striking of all has got to be the Charlotte Tilbury Golden Goddess Palette (£38). Four beautiful shades which blend seamlessly and are of such a fine and buttery formula; this baby is a strong contender. I love the luxe golden detail on the packaging and how Charlotte has done away with the sponge applicator, which lets face it, no one uses. I love this for wearing in the day or building up and adding the gorgeous glittery shade in the bottom left corner for an evening smokey look. I'm feeling festive just looking at it! The biggest all-rounder of the bunch has got to be the NARSissist Eyeshadow Palette. Packed with 15 permanent shades from the NARS range, this is perfect for either staying on the more subdued neutral side, or vamping things up a bit. 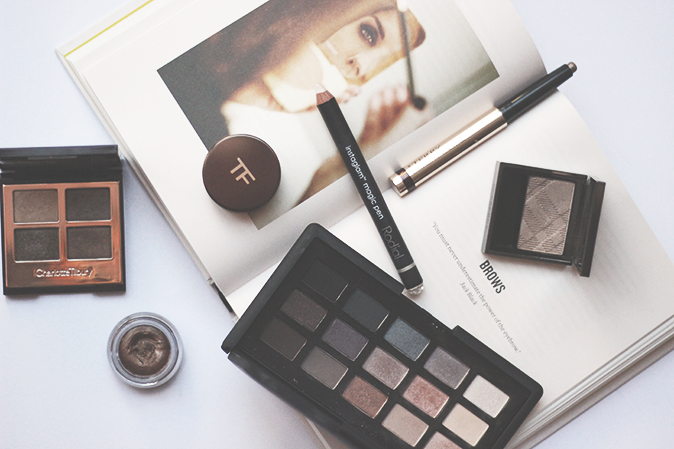 For staying power, the Tom Ford Cream Color For Eyes in Spice (£29) is a goody. A soft, mousse formula that glides on and once set ain't going nowhere. Spice is quite a warm, red toned bronze and it's really quite something. It appears to be sold out pretty much everywhere, along with the more cooler toned shade, Platinum, but if you can get your hands on it you won't be disappointed. For a simple wash of colour, maybe paired with winged liner and lashings of mascara, is the well loved Burberry Sheer Eyeshadow in Pale Barley No.22 (£22.50). While it might not look much in it's absolutely gorgeous gunmetal packaging, its a super pigmented flattering shade which goes with literally everything. I need more Burberry makeup in my life! Another well loved and hyped eye product is the ByTerry Ombre Blackstar in No.4 Bronze Moon (£28). Super easy to apply, this is great applied all over the eye and smudged into the lower lash line. It blends beautifully and has great staying power. I quite like this one applied to add definition over Pale Barley. Whichever of the above I go for, I will most definitely be adding the Rodial Instaglam Magic Pen Eye Glow (£22) to the inner corners of my eyes. This pearlescent pencil brightens up the eyes and helps fake a good night's sleep. I love the gorgeous crystal look end as well, super chic. I hope you all have an awesome Christmas, and I'll be back in a couple of days when I can pull myself away from the box of Celebrations...maybe. The post Christmas Day makeup: luxe eyes appeared first on Lelore.